Recent news reports have made 'Polonium-210' virtually a household word. An incredibly toxic and powerful Alpha radiation emitter, Po-210 is just about the last thing you'd ever want in your coffee. Come to think of it, it is the last thing you'd ever want in your coffee. In 2006, Russian dissident Alexander Litvinenko was murdered when someone slipped a tiny amount of Po-210 into his drink. It is also suspected in the death of Yasser Arafat. So, for those with a morbid sense of humor, we present our Polonium 210 Coffee Mug. 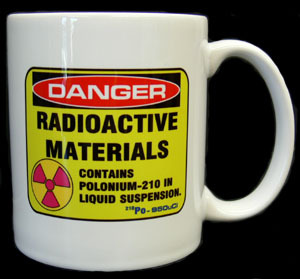 Mug reads: Radioactive Materials, Contains Polonium-210 in Liquid Suspension, 210 Po, 950 uCi." Like all our mugs, this one is printed in full color, on a high gloss, 12 ounce ceramic coffee mug - dishwasher safe of course.Graphic appears on both sides of the mug.